Imagine a microscopic plastic wire that cuts through and breaks apart dust, dirt, grime and moisture, and then picks it up like a magnet without scratching the surface. This is what microfiber does when cleaning. Our microfiber is a revolutionary thread, comprised of wedge-shaped polyester filaments and a core of nylon. Made of both oil-attracting and water-attracting polymers, the fibers are woven into masses of tiny "hooks & loops." The sharp edges of these millions of "hooks & loops" cut through dried-in stains, attracting and absorbing dirt and microparticles. The fibers are actually positively charged which increases the attraction of dirt because it carries a negative charge. Each strand is hundreds of times smaller than a human hair and ten times finer than silk. Microfiber cleaning products are a breakthrough in textile technology and have been widely used throughout Europe for years. They are used by large institutions such as hospitals, hotels, and professional cleaning companies, as well as by small businesses and households. Microfiber is the environmentally-friendly choice for cleaning worldwide. Our cloths, mop pads and other tools are so specialized, only a handful of factories worldwide have the capability and capacity to manufacture them efficiently. So how does it work? Is microfiber presoaked in some kind of chemical? No, it is not treated with any chemicals. The fiber's wedge shaped filaments follow surfaces, lift up dirt, trap particles inside the fiber, and eliminate the need for harmful cleansers. The capillary effect between the filaments and nylon core creates a high absorbency, which in turn enables it to clean and polish at the same time. Only water is needed as a detergent to clean any type of surface. Cleaning with microfiber is fast, easy and environmentally friendly. 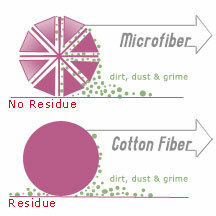 With microfiber products you rarely need to use chemicals. It is sometimes described as having a magnetic attraction to dirt and dust. Our products are extremely soft, and they never scratch any surface, but at the same time they are sturdy and tough on dirt. The secret behind the technology is the blend of microscopic polyester and polyamide fibers which are split in such a way as to create microscopic "hooks" which act as claws that scrape up and hold dust, dirt, and grime. They can also absorb up to 7 times their weight in water. This absorbent property is the reason why it will never leave streaks or water spots on any surface even when used wet. The gentle scrubbing properties of the ultra-fine fibers allow you to buff out old water spots safely, even on plastic windshields and tinted window film. No other cleaning material can compare to microfiber! Not only is this state-of-the-art product 100% hypo-allergenic, it is environmentally sound. A study released by the Environmental Protection Agency, concluded that quality microfibers, like those used in our mops and cloths are less work intensive, more cost effective, environmentally safe, reduce chemical use and disposal, and clean far more effectively than conventional cleaners. It is safe to use on all automobile surfaces, computer screens, television screens, delicate camera lenses, glass top stoves, vinyl, silver plate, tile, brass chrome and much more. The best part about microfiber is that it is totally reusable. Machine wash our products hundreds of times without compromising their ability to clean.